by J. Joseph Marr, M.D. Fall from Grace is a candid, personal history of an academic physician and biotechnology executive that reflects on medicine as it was in the mid-twentieth century and chronicles the changes in society and medicine during the second half ﻿﻿﻿of that century. The book investigates the social revolution of those﻿﻿﻿ times; the scientific and technological advances that occurred; the influence of the computer and the digital revolution; the entry of corporate management into health care; and the effects of the profit motive on the care of patients. All of these have had enormous influence on the role of the physician in health care. The inadequacies, over the years, of the fee-for-service system and the consequent governmental involvement in the reimbursement systems are discussed and compared with other health care payment systems around the world. The net effect of these various forces has been to benefit patients through greatly improved technology yet has caused medicine to evolve from an art form focused on personal care to a more technical exercise largely controlled by fiscal considerations. They also refashioned the role of the physician from healer and counselor into manager of an impersonal health care team. 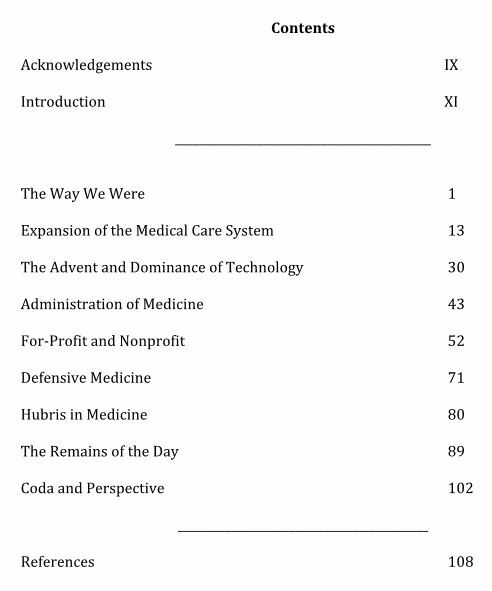 The book provides a view of the current state of medicine, patients, and physicians and a perspective on the future.